1. Start with a 30x30mm./1 1/4″ x 1 1/4″ piece of hardwood (ash, oak, maple, hickory, birch, beech, or almost any other hardwood will be fine) the same length as your height. Check which end has better grain and fewer knots and choose that as the blade end. 2. Find the centre and mark it “A”. Approximately 5cm./2″ up from the centre make another mark “B”. With your shoes off, stand the piece of wood beside you. Point B should line up with your “hip joint” as shown at right. 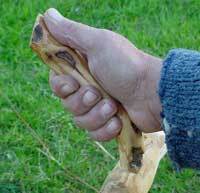 If the snath you are making is for a shorter blade (under 65 cm) and thus for “trimming” work, centre the mortise for the grip at point B. If for “field mowing”, make this mortise at point “C”–5cm/2″ further from the blade. 3. Drill three 1/4″ or 5/16″ holes next to each other. 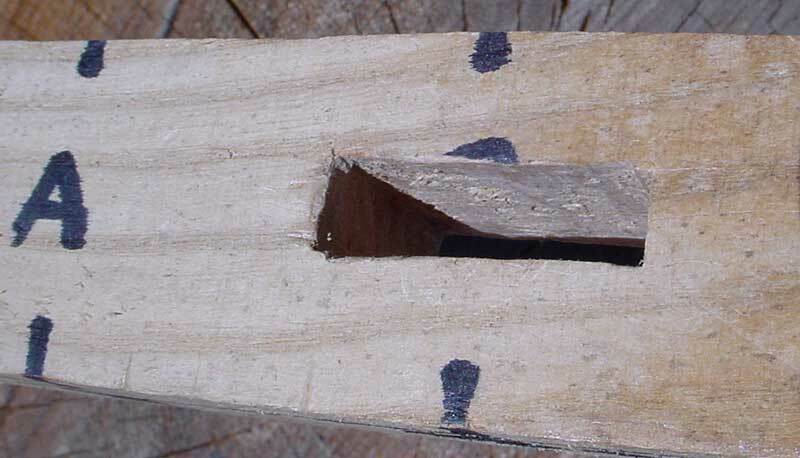 This example shows the mortise being made at “B”–the setting for a trimming snath. 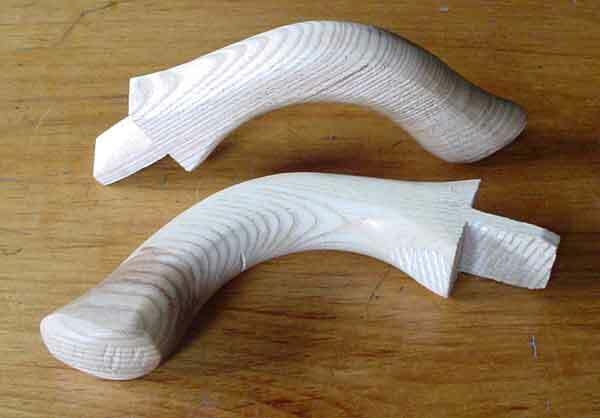 If you bought a grip from our catalogue, the tenon will be sized to fit in the mortise as described and pictured. 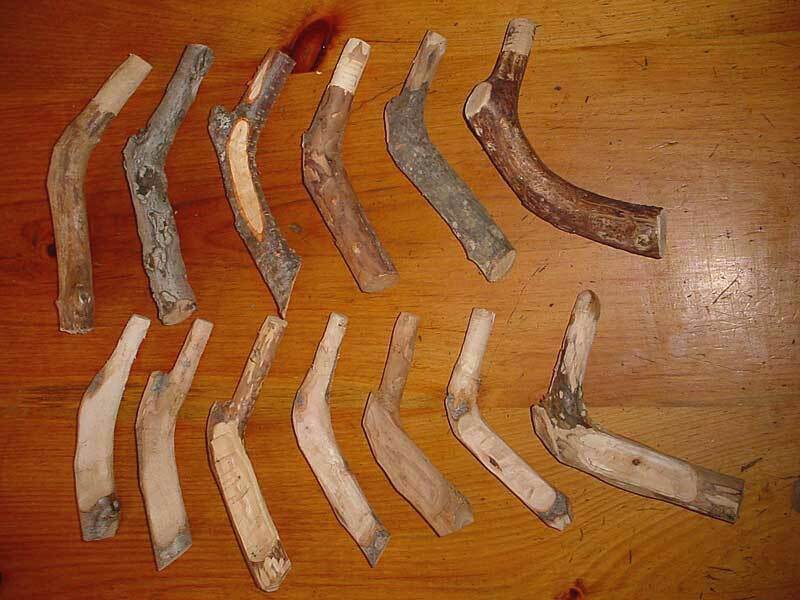 You can also make your own grip of a similar shape from a section of tree limb, or saw the curved shape out of a piece of hardwood. 1 1/2″ long copper rivet or a small bolt and nut. 5. Drill a 5/16″ hole 1/2″ deep approximately 3 1/4 inches from the blade end of the snath. Square the hole with a small chisel or carving knife. This is the seat for the knob on the blade’s tang. 6. Round off 12″/30cm of the top end of the snath with a drawknife or rasp and smooth the wood with sandpaper or a cabinet scraper. This part forms the upper grip. 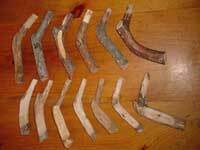 The finishing touch is to paint your snath with one or two coats of blended linseed oil and turpentine. 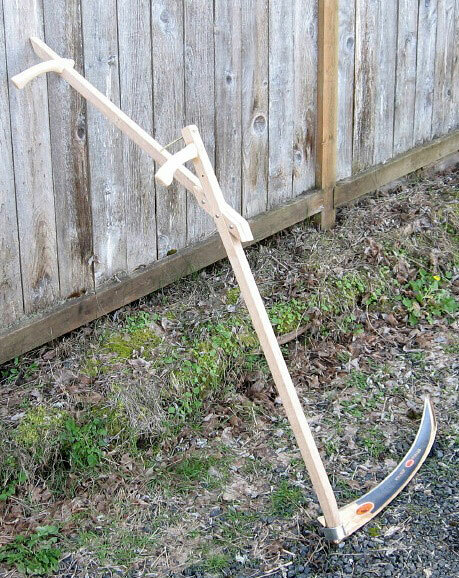 This will protect the wood from moisture and rot, though the scythe should still be stored indoors. 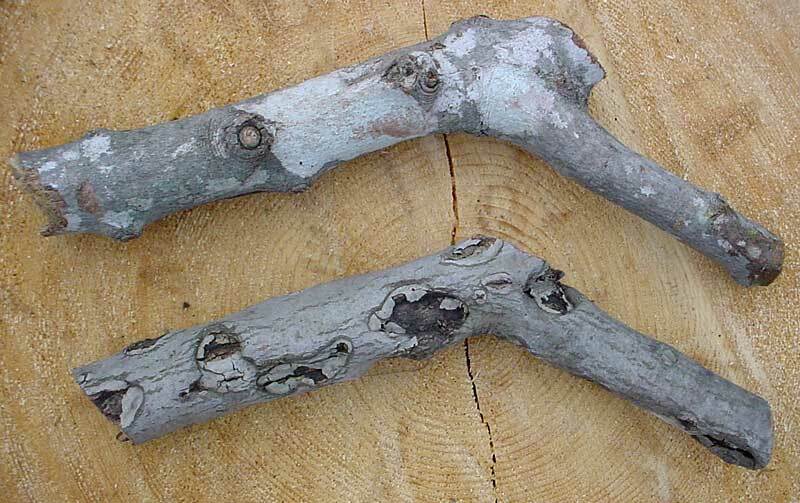 Use a tree sapling about 5cm./2″ in diameter and follow the same procedure as above. There are two potential benefits with this method. 1) You can find a sapling with curvature near the bottom which works with any tang angle regardless of your height; i.e. you can make use of any blade model, provided the hafting angle is satisfactory. 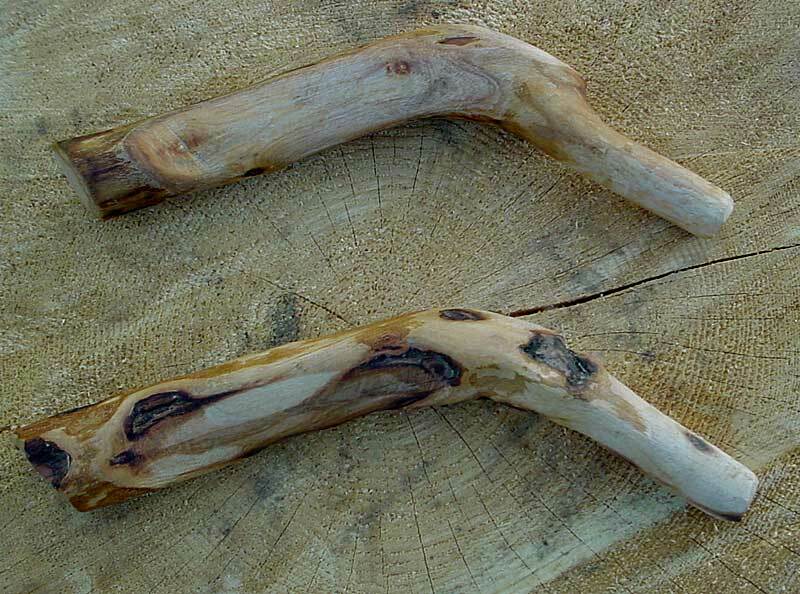 Making a grip for the Eastern-style snath from wild wood. 1. 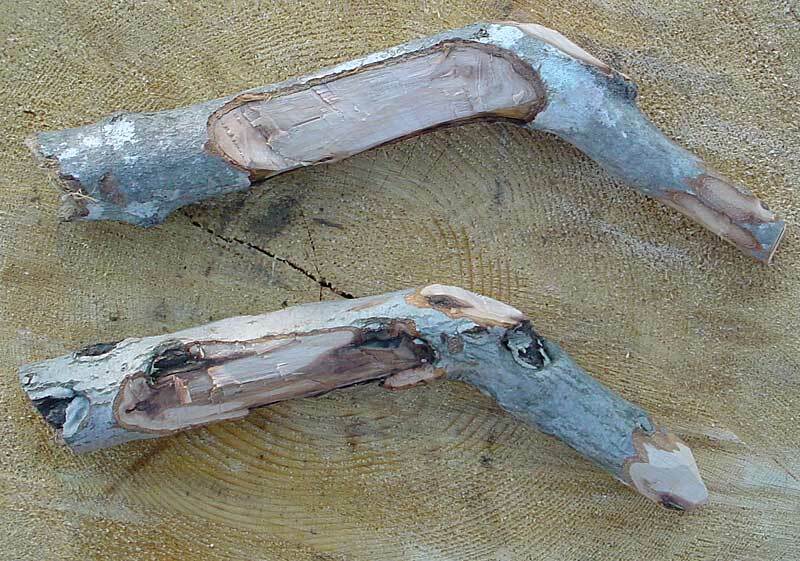 Two “raw” grips cut from a piece of branch. 2. The second stage: after a bit of shaping with a hatchet. The grips finished with a wood rasp and the tenons sized. A variety of possible shapes and sizes of grip. The grip installed–a round hole is drilled in the shaft as a mortise. (Lee Valley warns that these are for use only in a drill press, but we have used them for years in a hand brace. You will need to grind or file down the round shank small enough to fit the chuck, and square or hexagonal so it holds tightly). The round tenon can also be made with a drawknife, carving knife, wood rasp etc. The mortise is made with the appropriate size of drill or brace bit. The thickness of the main shaft of the snath at that point–approximately the middle of the sapling–should be greater than the 1 1/4″ square stock discussed above. Experimentation and creative thinking, along with an understanding of the physics and mechanics, are the key to success. A tall person who wants to use a scythe has limited options for finding a well-fitting snath. The one-grip “Slavic” or “Eastern style” snath is a good option (as presented by Peter Vido here with instructions for making them). Its straight shaft requires a relatively steep-tanged blade, and the single grip is forward-facing. The “Oregon Snath” (named for easy reference) is a two-piece, two-grip snath design inspired by the one-grip snath. Made with a similar total length of the same straight shaft material as the one-grip snath, the Oregon snath has two pieces connected at an angled joint, with backward-facing grips. The right-hand grip is connected directly to the main shaft of the Oregon snath (instead of the branched connection of typical two-grip snaths) which should give some mechanical advantages to the right wrist and in theory would make the scythe easier to control. Ideally, the ergonomic Canadian grips (developed by Peter Vido) should be used. The result is an optimally-fitted, ergonomic two-grip solution not just for tall folks, but for anyone with a suitable scythe blade they want to use with a two-grip snath. 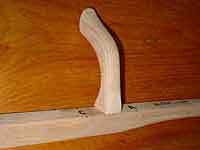 Like the one-grip snath, the Oregon snath can be made at home using hardwood lumber. A unique feature of the Oregon snath is that it can be disassembled into two halves for easier transportation. With both grips removed, the snath can pack down to an especially compact size. The following brief instructions will attempt to explain what is not obvious from the photos, and will skip some details that are already covered on the ScytheConnection.com site. See the references below for the related information. To estimate the required tang angle for anyone, regardless of height, a scale drawing can be made on graph paper, or a bit of trigonometry can be applied. Assuming the person is right-handed, measure the the height of the right hand in the mowing stance (usually with the right arm almost completely straight), and divide this number by the theoretical distance between right grip and end of snath (following the instructions for making the one-grip snath), and find the arcsine (or “inverse sine”) for this quotient. The result is the approximate tang angle required for both the one-grip snath and the Oregon snath. The hardwood lumber (1-1/4″ square section) should be at least as long as the user’s height. Two shorter pieces can be used, one piece about six inches longer than the hip joint measurement (from the one-grip snath instructions), and the other piece about 16 inches longer than the length of the user’s cubit measurement from elbow to outstretched tips of fingers. Having the blade on hand, the first step of the precise fitting process would be to shape the end of the shaft to fit the blade. With the blade attached and resting on the ground at the proper angle for mowing, the optimal grip locations can be determined, starting with the right-hand grip. The unattached grip can be held by the user and tentatively positioned along the snath to find the best location. The distance from the right grip to the blade end of the Oregon snath should be similar to that described in the instructions for making the one-grip snath, but this distance can vary according to the physiology and preferences of the specific user. 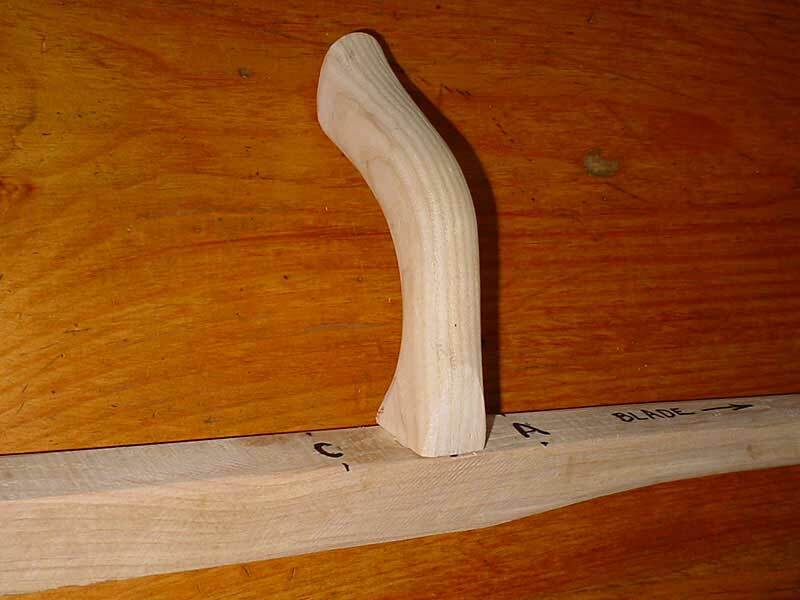 The tenon of the right-hand grip is then fitted into a hole in the snath (but not glued yet), or a removable right-hand grip (with hanger bolt and squared-off base) can instead be fitted into a dado in the snath, similar to the dado for the left-hand grip (in which case, the right grip can now be bolted into place, but don’t cut the dado yet). In the case of a removable grip, a second position for the right grip can be added, to give a position for field mowing and an alternate position for trimming.